BERNARDINI (USA) (Bay 2003-Stud 2007). 6 wins from 1m to 1¼m, Pimlico Preakness S., Gr.1. Leading NZ Sire of 2YOs 2012-13. Sire of 983 rnrs, 581 wnrs, 55 SW, inc. Cavorting (Saratoga Test S., Gr.1), Ruud Awakening, Boban, To Honor and Serve, Alpha, Stay Thirsty, Dame Dorothy, Angela Renee, Go Indy Go, Greenpointcrusader, Rachel's Valentina, A.Z. Warrior, Biondetti, Le Bernardin, Toydini, Lewis Bay, Zanbagh, Imperative, Gamilati, Wilburn, etc. Just Destiny, by Conatus. 4 wins-1 at 2-at 1200m, 1300m, A$117,175, BRC River Junction Droughtmasters H., Greenslopes Private Hospital H., 2d BRC BNB Fresh Newsxpress The Gap P., 3d BRC Just Now H., L, Nudgee H., L, Racing Retro H., Sky Racing H., Queensland Reef & Beef P., Plough Inn Tavern H. This is her second foal. Dam of one foal to race. Just Destiny (Conatus). 4 wins. See above. In the Genes. 8 wins from 1200m to 2000m, A$180,075, to 2015-16, BRC Coca Cola Life H., PMP Limited H., Qld Tatt's RC Carlton Mid H., Ipswich TC Sub-Branch RSL H., 2d BRC IGT Australia H., Ipswich TC Queensland Times H., 3d BRC Ross Smith H., QCU Campaign H., Qld Tatt's RC Parnell Partners Group H., Ipswich TC Ramsay Plumbing & Drainage Pty Ltd H.
Dumfries. Winner at 1650m in 2016-17, BRC Gallopers Sports Club H.
Tale of Fortune. Placed to 2015-16, 3d BRC Brisclean 2YO H., Ipswich TC Rugby League P.
Initial Star. 2 wins at 1800m, 2200m, 3d BTC Northern City Finance Home Loans H.
Hans Christian. 3 wins from 1300m to 1600m in Aust. Tanoshimi. Winner at 1400m in Aust. Just Ordained. 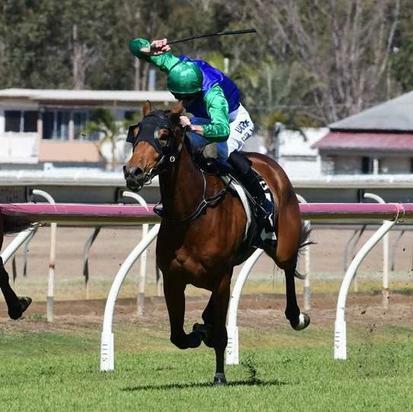 4 wins from 1400m to 1800m, 2d BTC GNS Quill 2YO H., QTC Centenary Classic P., Breakfast Creek Hotel H., Conrad Treasury P., Sunshine Coast 2YO Classic, 3d BTC Carlton Draught P., XXXX Gold P., QTC Tattersall's Bowls Club H., Hi Jinx P.
Spot the Rock (Fastnet Rock). 3 wins to 1300m, A$196,080, ATC National Apprentices H., BRC Ascend Sales H., 2d ATC Ara Wines H., BRC Nugrow H., Broncos H., Rochelle Lynch Happy 50th H., 3d BRC Queensland Guineas, Gr.2, STC Inglis 2YO Classic, ATC Rydges North Sydney H., STC Winning Post Restaurant H.
Overtheriver (Mettre en Jeu). 15 wins from 1150m to 1900m, NZ$251,225, to 2016-17, CJC Coupland's Bakeries Mile Trial H., Manawatu RC Carters Ashhurst Pohangina Cup, Reefton Cup-twice, Waverley RC CR Grace & Taylor Preston H., Manawatu RC Tru Test H., Crombie Lockwood H., Poverty Bay Cup, 2d Taranaki Cup, Gr.3, CJC Great Easter S., L-twice, Dyer Decorating H.
SEA GALLEON (Galileo). 5 wins from 1300m to 2400m, A$288,317, ATC Christmas Cup, L, MRC D'Urban H., MVRC Aquanas Foods H., 2d MRC Catanach's Jewellers Ladies' Day P., 3d South Australian Derby, Gr.1, Mornington Cup, L, VRC Galilee Series Final H., MVRC SAJ Catercare Group H., MRC Royal Charter H.